Just 8 days and counting till the big, green behemoth that is San Francisco’s most new and improved science museum opens in Golden Gate Park. 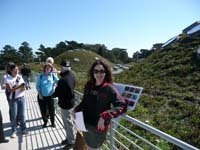 The California Academy of Sciences’ utterly anticipated opening marks TEN YEARS and tens of thousands of man and woman-hours with wild engineering marvels and the move of about 38,000 critters from their temporary Howard Street home to their final resting spot back in the park. 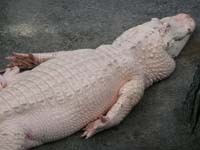 Claude, the famous albino alligator, had no comment at this time. Where Life Comes to Life as their slogan and mantra, the museum yesterday revealed to members of the press their two main themes–evolution and sustainability. Basically, how did we get here and how can we stay here? This question is answered through educational and interactive exhibits, planetarium programming, experiences with wildlife, and especially leading by example. The super green building boasts a living roof covered with native plant species that keeps temps inside 10-degrees cooler, solar panels (60,000 cells offset about 10% of their energy needs), water reclamation, radiant subfloor heating and more! The Rainforest: An open, three-tiered and 3-D look at rainforest life complete with birds and butterflies in the canopies and ants tidying the leaves at your feet. A balmy 75-degrees with 75% humidity, be prepared for some extra curl in your hair! The realistic exhibit is designed so that guests can ‘migrate’ up a winding walkway from the forest floor to canopy making discoveries along the way, like tiny vibrant froggies in the leaves. Lead scientist Dr. Chris Andrews promises that within 3-5 years these young trees will have all grown up, covering the living rainforest in dense vegetation. The way to look at rainforests? It’s as “if nature threw a party and everybody came!” I love it. Philippine Coral Reef: The world’s most diverse coral reefs are found in the Philippines, a choice model for the living coral reef inside the aquarium. Though all this coral was grown in captivity, it nonetheless will evolve dynamically before our eyes! This is the world’s largest indoor coral reef. *A quick note on the large California octopus. She’s lovely in lavender and a total escape artist. Dr. Meg Burke, head of that part of the aquarium dedicated to local sea life, told us that this lady octopus has the only astroturf-covered habitat because she can squeeze herself through holes barely bigger than your fist! She enjoyed baffling unsuspecting biologists who would get to work each morning to find the crab population diminished overnight in the tank next to hers. She does not like the feeling of fake grass on her tentacles so, thus far, has caused little mischief! African Hall: Yes, one night at the museum may very well prove that the taxaderma-palooza of animals come to life after hours! But even if they don’t, these oldies but goodies—original hunted specimens from the 1930’s—were given new life when they were refurbished. Dr. Terry Goslinger insists that this is a classic diorama hall with all scenes representing real places in Africa. Look closely to see digital tricks in the background like images of elephants moving through the grass. *Pam Schaller, Mama to Penguins! 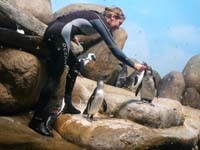 Twice a day, the live South African penguin population perks up in preparation for Pam. The star attractions in the African Hall, the cute and cuddly penguins follow Pam around as she pets them or plays with them, tossing them into the frigid water or rubbing their necks like a friendly hello. Food: With uber famous chefs-in-residence Charles Phan (Slanted Door) and Loretta Keller (Bizou and COCO500), the sustainable, local and organic food is outta this world at the Cafe and restaurant! You may think that the pricey admissions ($24.99 adults, $14.95 kids, $19.95 seniors) need to evolve, but you have to remember that this is the only institution of its kind in the world that houses three major attractions under one roof: an aquarium, a planetarium and a natural history museum. Seahorses, stuffed lions and stars, man! Plan for Wachovia Wednesdays, when admission is free the third Wednesday of every month. Bike or take public transportation to the museum for an extra $3 off ticket prices. Why is this institution ultimately so important? Dr. Carol Tang believes that “as Californians we are leaders. People look to us, and what we do impacts the world.” Perhaps we can change the world one building at a time! Performers, Activities and Food! See website for complete line-up. Events take place both in the Academy and outside in the Park. For all you mad scientists with mad money. Ticket prices start at $350 for a night of music, dancing and dessert. It’s a once-in-a-lifetime grand opening party! definitely sounds like a place to check out! :-) Thanks!